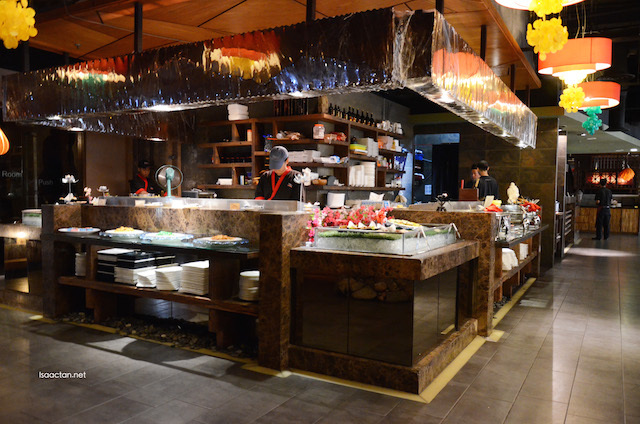 Looking for an All-You-Can-Eat Japanese Ala-carte buffet? Then you must go for the unlimited delicious Japanese cuisine, which is ordered from their ala-carte menu, available for lunch and dinner at Tao Cuisine Japanese Restaurant, Sunway Giza. I was there last week for lunch, and my, it was a feast. Check out some of the food available from their ala-carte buffet below. 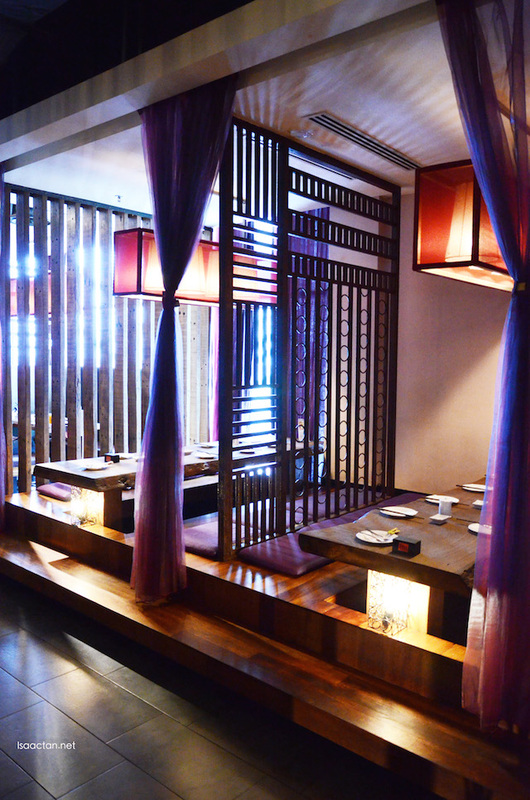 The restaurant includes specialties such as Japanese, Chinese, Thailand, and other foreign or ethnic food. Tao restaurant with 300pax sitting capacity is catering for special occasions such as birthday, Family gathering, anniversaries, banquets, special event, receptions and meetings. 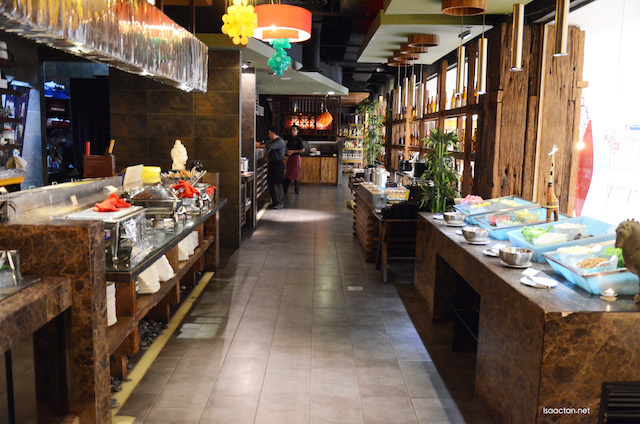 The buffet concept offers unlimited service with customer’s food ordering from the menu provided at the table. With the unlimited choices customer can order any items from the menu and you can repeat order without any limits until you are satisfied. How awesome is that! With more than 130 dishes to choose from, we were basically spoilt for choice. Each dish is served pretty fast too, each made ala-minute and fresh. Two dishes which looked almost alike, but are very different inside, both the ingredients and sauces used. 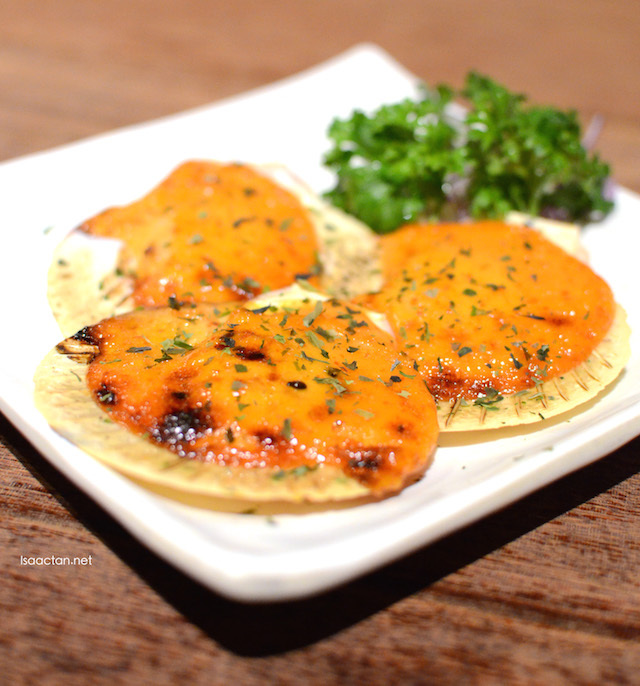 The Motoyaki Scallop came on a plate with 3pcs of baked scallop with spicy mayo. 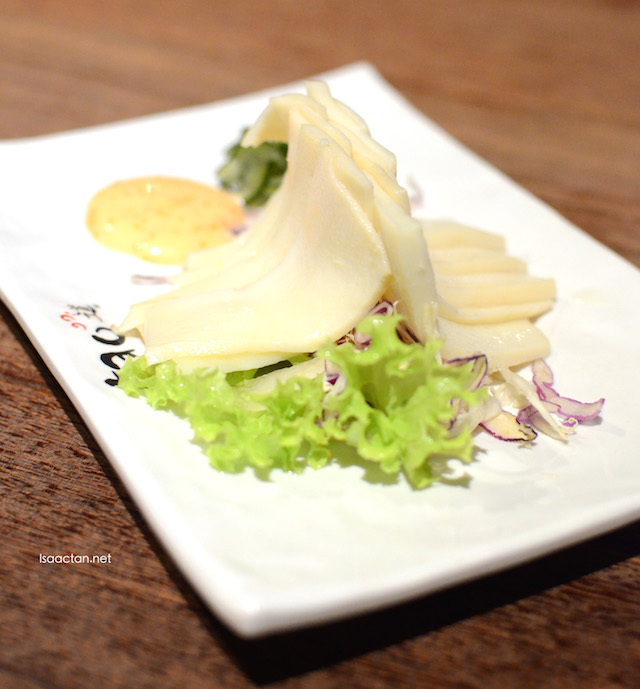 Love how the spicy mayo sauce gives that oomph to the freshly baked scallops. 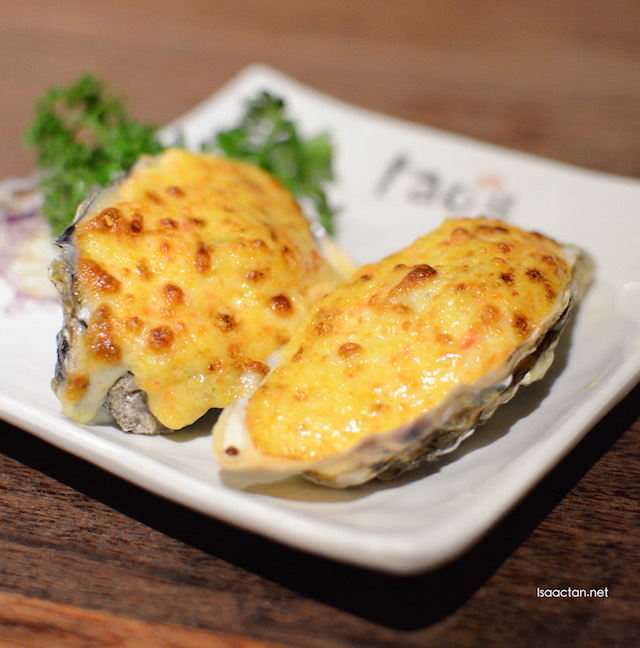 If you like oysters, then do order the Kaki Hiroyaki, which is basically baked oyster with cheese mayo. Both these dishes can be found on Tao's menu under the Yakimono section. 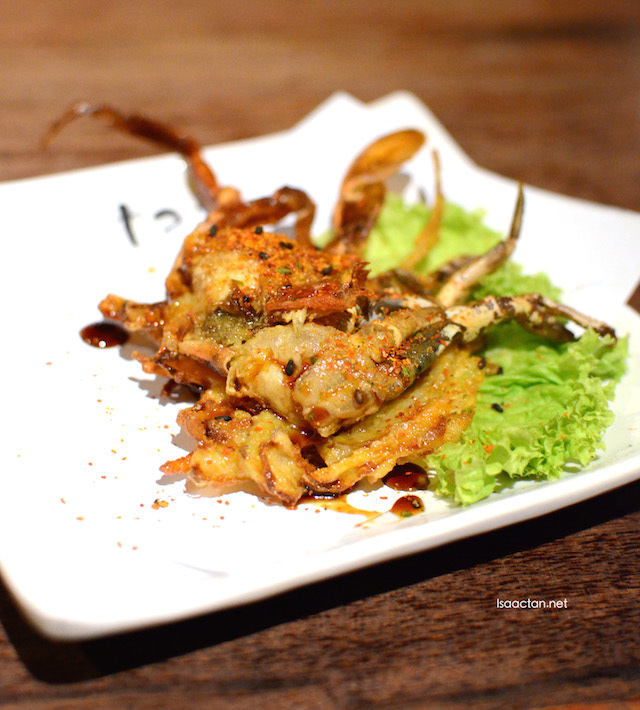 My all time favourite dish from any Japanese menu would be the Soft Shell Crab Kaarage. Here at Tao, they serve these delectable crunchy deep fried soft shell crab with accompanying assorted vegetables. Love how they sprinkle some sort of chili flakes on top, adding to the flavour. Available under the Age Mono section of the menu. Lovers of sushi and and maki will be delighted to know they have an assortment of varieties available to order from their menu as well. 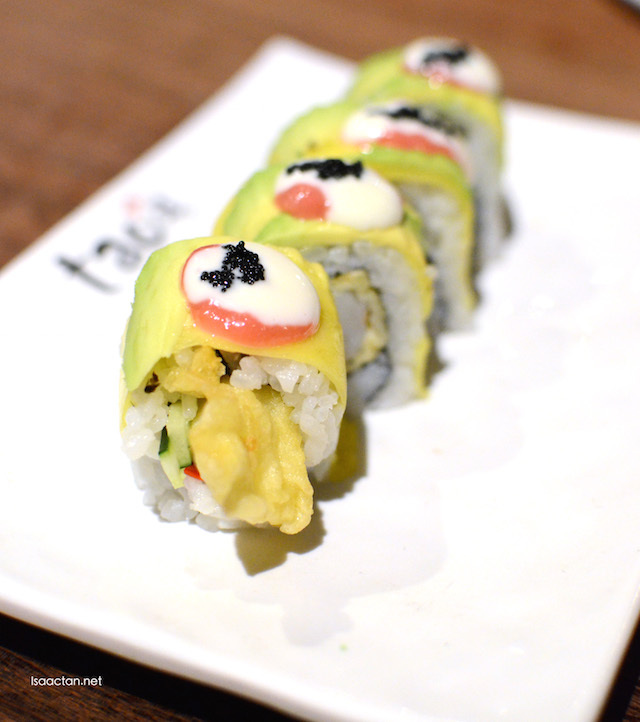 We tried the Green Dragon Roll which contained deep fried prawn, cucumbers, kani, avacado, and mango, going rather well with our palate. The Awabi Ebiko is pretty good too, abalone with ebiko sauce. 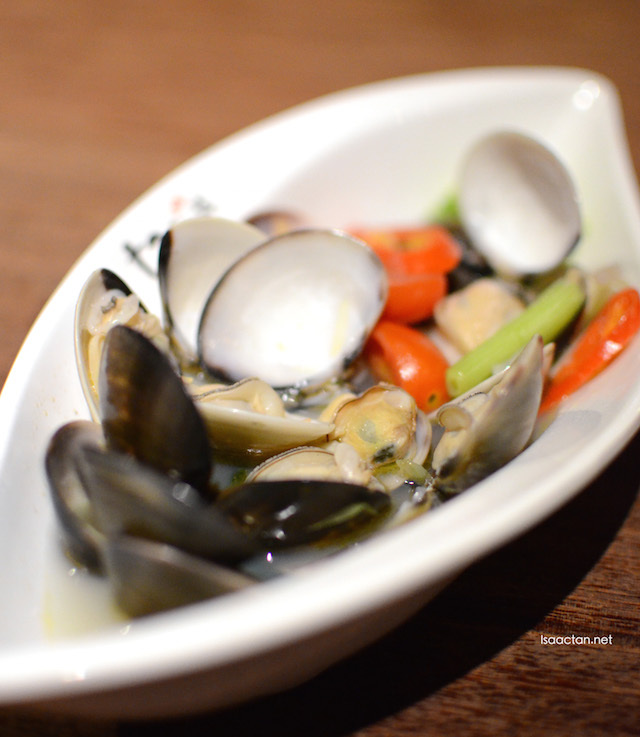 Tao Cuisine is proud to present some really nice grilled seafood and meaty dishes too, found on their ala-carte menu which can be ordered during your dine-in. 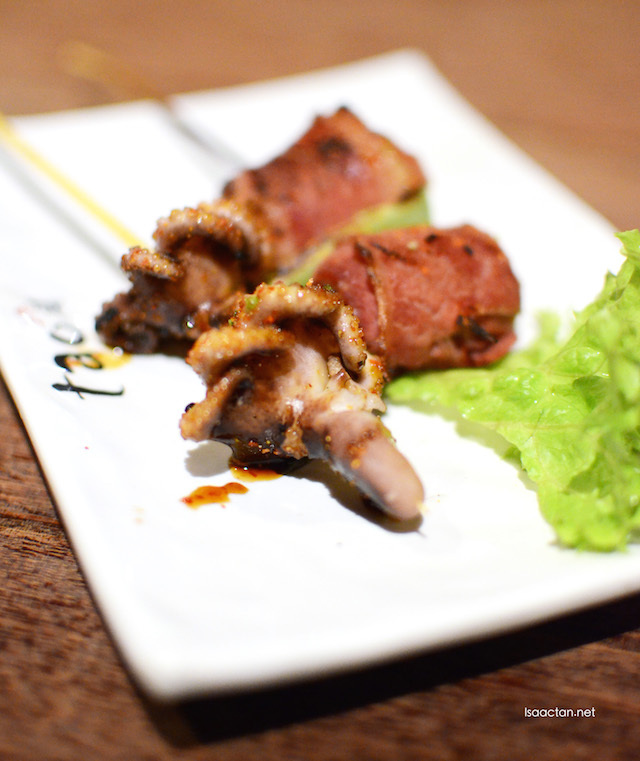 Love the cutesy Idako, baby octopus served on a plate with bacon by the side and nicely done grilled chicken. 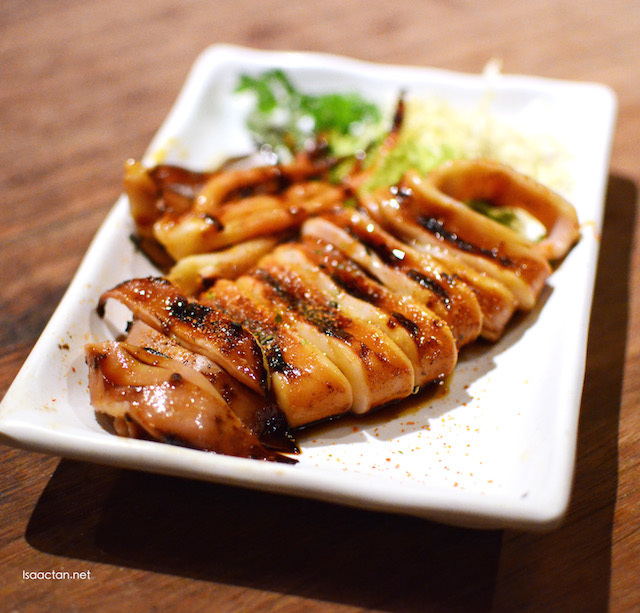 If you're in the mood for grilled squid, then be sure to order their Ika Teriyaki, served in teriyaki sauce. 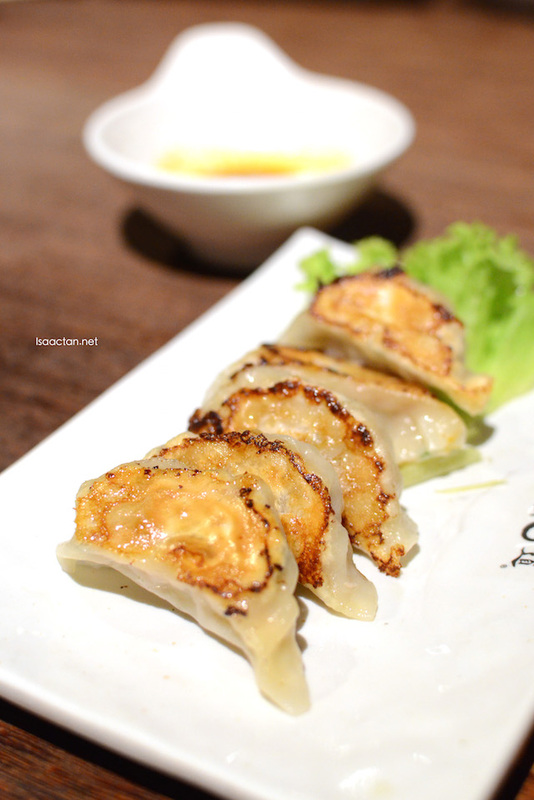 They serve good Gyoza too, panfried to perfection, the minced chicken dumpling goes well with soy sauce, or just taken on its own. I personally called for more of their very unique mentai sauce, perfect to be dipped into. 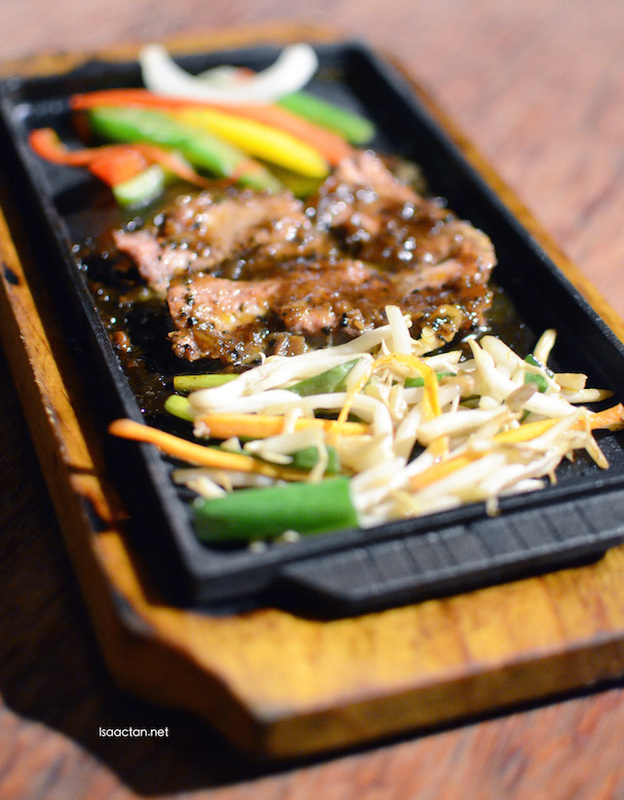 On top of ala-carte dishes from the menu, you can opt to order their teppanyaki sets too. We had the Black Pepper Beef Teppanyaki, which came with generous amount of pan fried beef doused in teppanyaki sauce. On that same teppanyaki menu too, you can order duck, snapper, beef bacon and even kimchi teppanyaki. Stir fried clams with Japanese rice wine makes up the Sake Hamaguri dish, something which goes well with a glass of Japanese green tea if you asked me. 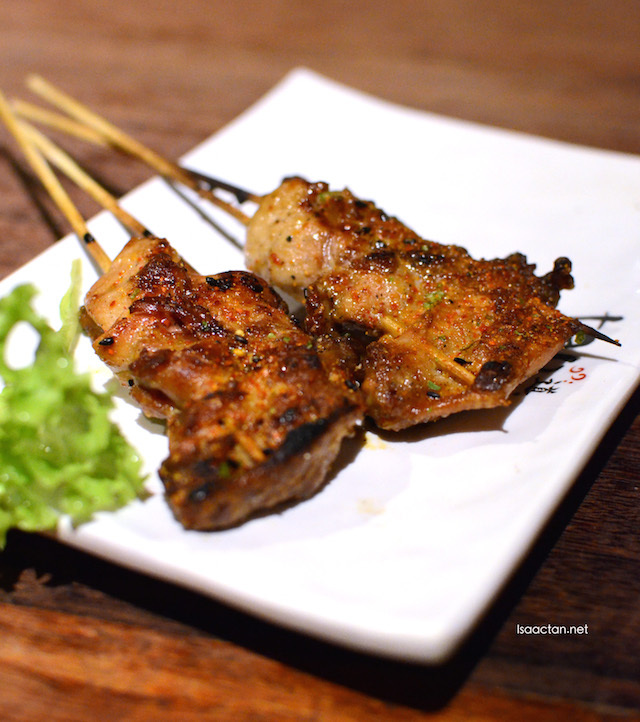 We had so much other dishes during our lunch meal at Tao Cuisine that day. With over 130 dishes to choose from, my advice would be to come hungry, real hungry as you will walk out being filled to the brim. The prices at Tao Cuisine All-You-Can-Eat Japanese Ala-Carte Buffet @ Sunway Giza are pretty affordable too, for the quality and variety available, going for lunch RM59.16 nett mondays to fridays, RM71.92 nett Saturday, Sundays and public holidays. Dinner is pegged at RM71.92. Current pricing, it's really worth the price you pay! What's an Ala-Carte Buffet? You order what you want from a menu, no buffet spread to go and pick your choices...or there is both ala carte and buffet. I actually asked the same question! hehe, they have a mini buffet spread, but the rest, you order from their ala-carte menu, and it will be served. Pay once, order as many times as you want until you are filled. A lot of people mention Tao food is nice. Fresh and worth for price. Japanese cuisine seems to be the in thing right now. Many friends have already recommended Tao. It is definitely going into my makan list when I am in KL. Japanese foodssssss...gonna try out these! I'm always craving for japanese food.. So yummy! What a beautiful platter of food and i am loving the photos you have captured. Woo their grilled chicken look damn nice! So tempted to try it out. Thanks for sharing ya! Wow... all the foods pic makes me drool. I love ala carte buffet style! hehe. love to eat buffet, it's time eat nonstop. But don't over eat, hard to sleep at night. Oh I went there with frens many years back. Their price not bad still maintain at low prices oh. Its been a long time since I am here with my college's mate. The price increase alot since then. Interior and sitting area still looks comfy and nice! OMG look at the baked oyster, with so much cheese!!! All you can eat? That is nice. Ahhhhhhhh nom nom non! Just a quick question. Do they serve Sashimi too?